These jackets are manufactured to equip all commercial vessels. 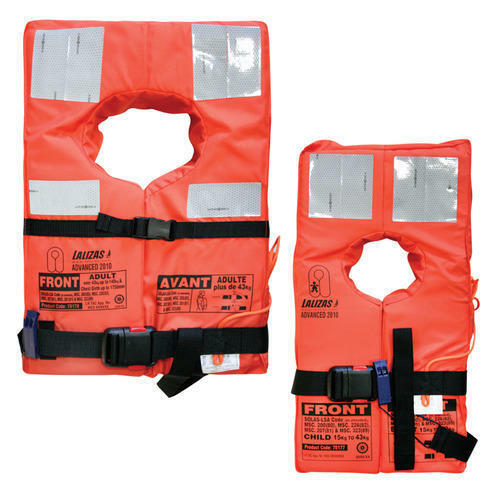 They fully comply with the requirements of the regulations (IMO Regulations), which are mandatory for all life jackets used on-board Community ships. They are supplied in adult and child sizes. The adult lijacket is appropriate for passengers with chest size up to 175cm, oversize passengers, while are provided with lifting loop and yellow buddy line for easier rescue. It is also recommended to combine the life jacket with the compatable Lalizas Life jacket Light. Marine Marketing Services was founded in the year of Millennium. The company acquire ISO 9001:2000 Certification classified by RINA. The company is engaged in Ship Chandling, Importing of new marine equipments, Exporting and refurbishing all kinds of Used and Unused Marine Equipments. Today since six years it has established itself in providing imported as well as Indian Manufactured products, service, and support to many Shipping Companies and Ship Chandlers. In order to service the Shipping Industry all across the country (India) it has opened its own workshops at Mumbai, and Chennai .Also associates all over major and minor ports of India.